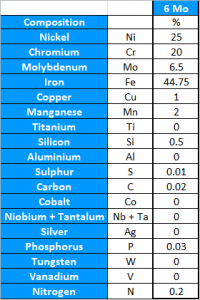 Alloy 6 Mo (UNS S31254) is a super austenitic stainless steel, its higher levels of molybdenum of 6% and an increase of chromium and nitrogen sets it apart from the 316 grade of stainless steel. 6% Molybdenum stainless steel alloy can usually be found in the forms of seamless and welded tube, specialty forgings, plate/sheet or round bar. Tube and tube compression fittings manufactured from 6 Mo stainless are available in our Duoloc and Ringlok as part of our Special Metals range. 6 Mo austenitic stainless steel alloy is designed for high performance in corrosive areas. It holds properties that give excellent resistance in cases where organic acids and seawater is present. 6 Mo stainless steel is known for its resistance to crevice corrosion and corrosion resistance in seawater. These properties are particularly useful for piping, pumps and valves. Areas where high levels of chloride is active, such as brackish waters and pulp mill bleach plants, 6 Mo is often used as an alternative to stainless steel 316. The high level of molybdenum and nitrogen provides a high resistance to crevice corrosion and pitting corrosion. Applications in which 6 Mo can thrive include seawater systems and desalination plant equipment. 6 Mo material in the annealed condition has good machinability when using conventional methods. 6 Mo is generally considered more technically suitable and cost-effective in comparison to nickel-based alloys. It can be used within installations that require resistance to seawater corrosion. It is for this reason; the alloy is frequently used within areas of the Marine and Offshore industries. Molybdenum has the sixth highest melting point of any element, which makes 6 Mo popular for uses in areas where high temperatures are a concern. Waverley Brownall currently hold moderate stock in a wide range of compression tube fittings in 6 Mo material. Raw material is held to readily manufacture other requests. Tube fittings available include bulkhead couplings, tees, elbows and adaptors in a range of threads. Up to 1” or 25mm tube OD sizes. Waverley Brownall can supply 6 Mo tube in many lengths, with a minimum of 1 metre. Our most popular tube length is 3 metres. 6 Mo tubing can be used with exposure to medium to high chloride presence. It is a cost-effective solution for areas where seawater is causing weakness to tube and tubular products. The general principles for material selection for corrosion prevention and resistance are commonly known. Purchases must comply with the guidelines for material selection within your industry or sector. The application of 6 Mo stainless steel tubing, tube fittings and instrumentation must have the primary consideration of health and safety risks. The mixing of tube fittings of different manufacturers and material composition is not recommended with the concern for health and safety. Waverley Brownall products are not to be mixed with components such as Parker Hannifin or Swagelok fittings.